Not as in the grass is always greener, but as in finding a more sustainable landscaping option for your home. First, I want to discuss the benefits of landscaping in general. When you have a nice front yard, it maximizes your curb appeal, it can make your home stand out as one that is better taken care of overall. Good landscape makes for good first impressions on potential home buyers when you’re on the market, which increases your home’s value. It can also increase the way you think about your home, making you feel happier and more content with where you come home to everyday. That said, why not look into a more sustainable option that requires less upkeep and less maintenance overall so that you can have your beautiful landscaping and have the time to enjoy it too? Help a mother out, Mother Nature that is, and help yourself in the process. Sounds pretty good doesn’t it? So, how do we achieve a greener landscape? It all starts with the planning. Limit the lawn. It’s okay to have a grassy area, but this grassy area uses a lot of water, mowing (more energy and air pollution) and overall just more maintenance to keep it look nice and fresh. So think about ways to decrease the amount of land your grass is covering. Start with healthy soil. Healthy soil makes for healthier plants. Remember when I mentioned starting to compost yesterday? Composting makes for incredibly healthy soil. Add beds around the perimeter. You can put anything in these beds, make a rock garden, make a garden filled with flowers, veggies, etc., the more beds the better. Look for native plants. Native plants are those that are native to your region, the are more likely to thrive in your area with limited support by you. Avoid invasive species. Invasive plant species will require more care, and they aren’t likely to thrive in your area without a lot of help, so it is best to leave them off the list. Find plants that thrive in your regional and micro-climate. Do you get a lot of shade in your yard? Cater to shade lovers. A lot of sun, look for sun lovers. Group plants according to maintenance needs. If there are plants that require more water, instead of running around the yard with the hose, you can go directly to where the water is needed and reduce the water you are using. Avoid high-maintenance plants. High maintenance is high maintenance, and even if you are an avid gardener and you can keep these high maintenance plants feeling lush and looking good, they are going to require more energy, more resources, more everything, so remember in green landscaping, less maintenance is more. Build in walkways. Adding a pathway of gravel or paver stones, cuts down on lawn coverage while guiding the eye through the space, and guiding guests through the area as well. Now that we know what to plan for and what to include or exclude, we want to make sure it looks good. After all, to really reap the benefits of a beautifully and sustainably landscaped property, you want to make sure that it looks as nice as it functions. Incorporate different heights. Look for native trees, shrubs and tall grasses that are taller and can act as a nice backdrop for the rest of the plantings. You can also look into building or buying taller planters or terracing out areas with native stones or pavers to make a tiered planting area. Look at the texture. From a visual perspective, you want to make sure there is interest in what is there and visual texture is huge in creating something that is overall appealing to the eye. Try to incorporate different tall grasses mixed with different leafy plants, flowering plants, succulents and mosses, to keep the texture interesting. In addition to the texture of the plantings, you can add texture by incorporating boulders, sculptures or other features. The more variety you are able to incorporate, the better. Add Color. You can add color in vegetation and flowers that will bloom at different times, or look into adding something like a copper rain chain or colorful and whimsical garden globes. Incorporate patio areas and decks. Create a space to enjoy your newly landscaped space by incorporating a centrally located patio area where you can make an outdoor dining space and/or a place to just relax. You can consider adding a fire pit or a water feature to pull your chairs up around; make a zone for grilling and entertaining outside so you are ready to host at the drop of a hat. Add designated walkways. 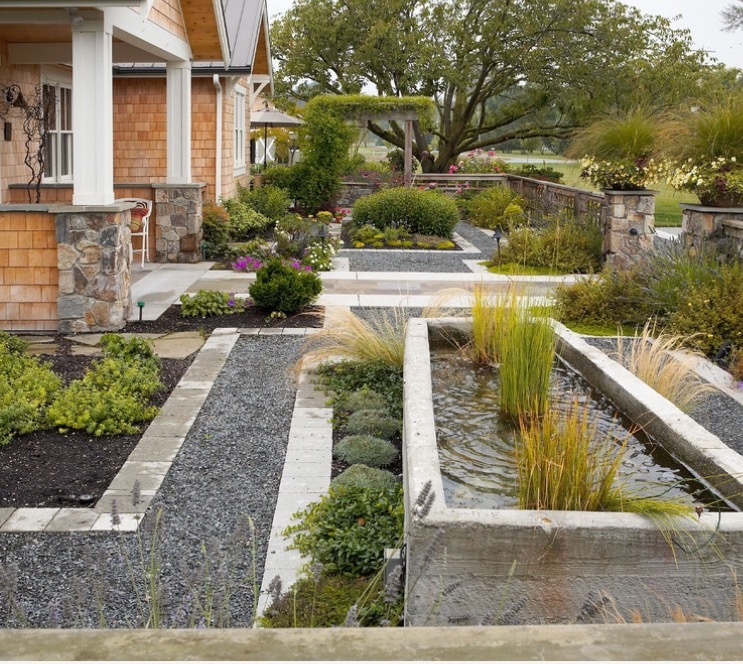 This is another textural element, but using gravel, pavers or decking will allow rain water to seep through and eliminate pooling or irrigation issues, while again limiting the amount of grassy space, and you can fill the gaps with moss or ground cover that is pretty, adds a soft element, and feels good on bare feet. Now that you know what to consider, it’s the perfect time of year to get started! You’ll be ready for summer entertaining in no time, you will have less maintenance to worry about year round, and what’s best, your conscience will be clear knowing that your landscaping is greener. If you live in a state that frequently has droughts, also look into tax-rebate programs that you may be able to benefit from by converting to less or no grass. Image sources: 1, 2, 3, 4, 5. 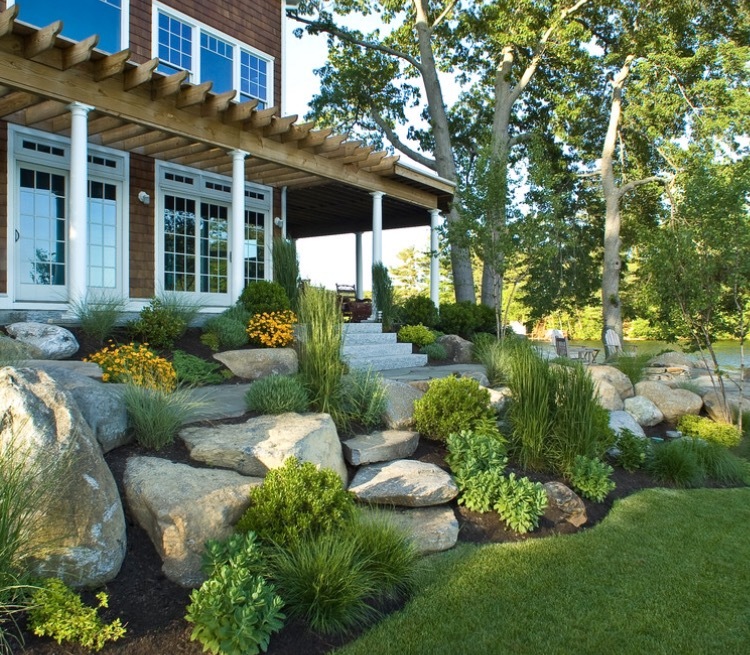 For more green landscaping inspiration, check out my Houzz ideabook, and follow us on Houzz so you don’t miss any updates!